Choosing the best camping air mattresses can be overwhelming! There are so many sizes, styles, and features to choose from – how do you find the right one? We found 10 amazing mattresses that will suit all kinds of needs and budgets, so you can find one quickly for your next camping trip, or keep one around when guests come to visit! Before we get into the reviews, here are a few things to consider before buying a new air mattress. Size: Most camping mattresses come in standard bed sizes (twin, queen, king, etc.). Choose the correct mattress size to fit inside your tent, vehicle, or spare bedroom. This also allows you to plan to bring sheets or blankets that fit as well! Dimensions: In addition to telling you the standard mattress sizes, we also noted the dimensions of each mattress when they’re fully inflated. That way, you can ensure your mattress will fit the space and height properly – especially for tents and SUVs! Pump Included: When buying a new camping air mattress, make sure to pay attention to whether or not it comes with a pump. Most come with an electric or hand pump of some kind, but others may require you purchase your own. 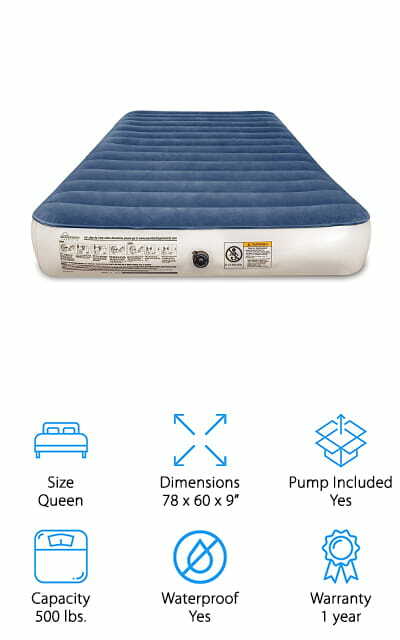 Capacity: Each air mattress has its own maximum weight capacity, which ensures the mattress will stay fully inflated and won’t burst while you’re on it. This is important to note, especially if you plan to sleep on it with a partner! Waterproof: A waterproof air mattress is important to have if you plan to take it on an outdoor trip or sleep out under the stars! It will not only repel water from the ground, it will also repel spills from drinks. Warranty: When investing in a quality air mattress for your next camping trip, it’s important to pay attention to the warranty! Defects happen, and it’s good to know the company will stand by their product and help if something goes wrong. Now that you have a good idea of what you’ll need, let’s find you the best camping air mattress for you! We researched a variety of air mattresses at a variety of price points that are perfect for backpacking trips, camping in the backyard, inflating in a spare bedroom for guests, and more! If you’re pressed for time, don’t sweat it! Check out our Top Pick and Budget Pick first, then come back when you have time! Let’s get started! Our Top Pick for the best air mattress for camping is this tall, comfortable airbed from Coleman. It comes with everything you need, including an electric pump and a zippered carrying bag. We like that the pump is built into the mattress because that means, even if it sits in your closet for months, you won’t have to worry about misplacing the pump or forgetting to bring it along! It’s also nice that the mattress has a double-lock prevents air leaks while you’re filling it up and while you’re sleeping! The mattress inflates to 18 inches tall, which is plenty to keep you and another person comfortable and far off the ground every night! It also fits standard Queen sheets, so no need to buy special sizes to fit your mattress! We think that this is a great air mattress to toss into your tent, or you could easily set it up at home when guests drop in to visit! 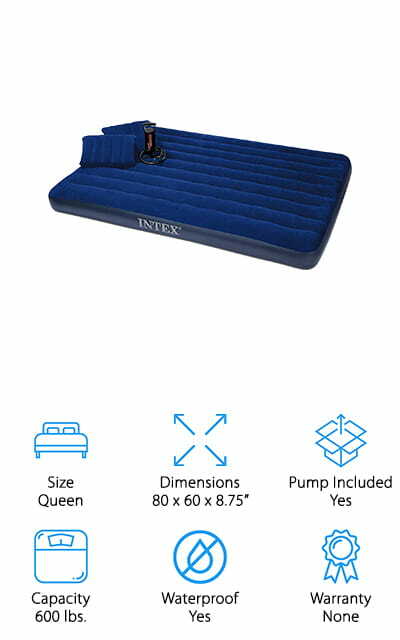 If you want the best cheap air mattress to take with you on your next camping trip, this one from Intex is a great option to toss into your backpack! It comes with a queen-size mattress and 2 inflatable pillows for a comfy night’s rest. We like that it comes with a hand pump, so you don’t have to worry about relying on batteries or electrical outlet to run the pump! The kit only weighs 12 pounds, so you can toss this into your camping bag without weighing you down! 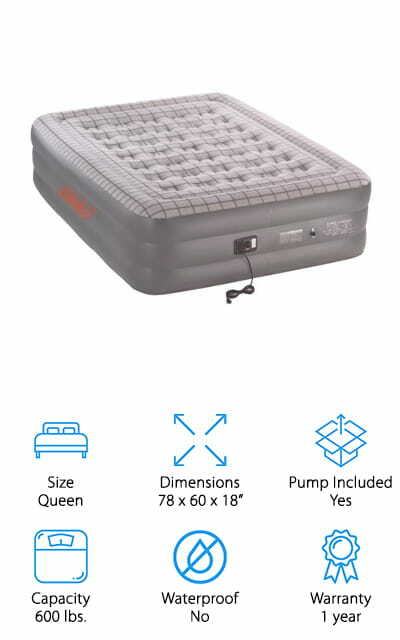 It has a sturdy 2-way valve that fills up the mattress fast and doesn’t let air out overnight. We like that it has waterproof flocking on the top of the mattress and pillows for added softness – especially if you’re not bringing extra blankets or sheets with you! You could easily use this at home as well – just toss on a queen fitted sheet and quilt, and it’s ready for guests! 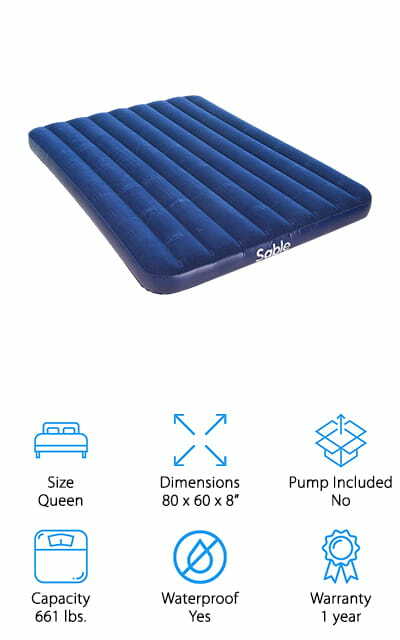 Next up is one of our favorites for a super lightweight large air mattress you can take with you just about anywhere for a cozy night’s sleep! This whole kit only weighs 6 pounds and it folds up small to fit in your backpack without taking up precious space or adding extra weight! The queen-sized mattress is perfect for 1-2 people and uses a patented stabilizing pattern to keep air dispersed evenly while you and your sleeping buddy move around. This is also a heavy-duty mattress that’s PVC and phthalate free! It’s made of highly durable and abrasion-resistant thermoplastic polyurethane (TPU) that is incredibly durable and more lightweight than PVC, making it perfect for tucking away in your backpack on long trips! It also comes with a battery-powered pump, so you can use it in places where electricity isn’t an option! This is a great mattress to take on your next camping trip without adding extra bulk to your kit! Looking for an air mattress that stays inflated all weekend while you hang out with friends at your favorite campsite? Grab one of these super comfortable mattresses from SoundAsleep! This queen-sized mattress inflates to 9 inches thick, giving you plenty of cushioning to keep you off the ground all night. It comes with an external pump with rechargeable battery so you can charge it at home, and then recharge it in your car if you need to top off the air over the weekend! The mattress fills in less than 3 minutes and empties quickly, thanks to a large 2-way valve, so you can get set up or cleaned up in a hurry! The waterproof top is velvety soft, and the material is thick to prevent punctures from common outdoor objects like rocks and twigs. It also works well as a spare mattress for when friends visit, or to take out to the backyard for a night under the stars! 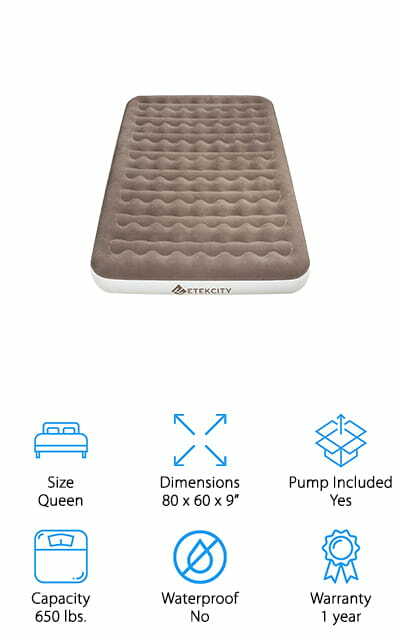 Another great option in our camping air mattress buying guide is this thick mattress with built-in pillow by Intex! This mattress is built more for home use, but could easily fit inside a large tent for campouts in the backyard! It is a standard queen-sized mattress that inflates to a whopping 16.5 inches tall! 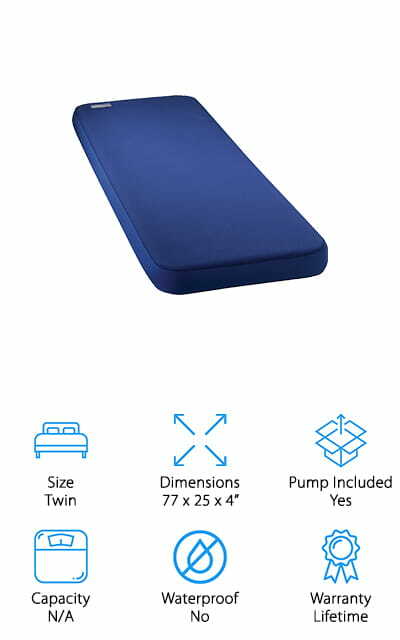 The kit includes a duffel bag for easy storage and an electric pump that inflates the whole mattress in less than 3 minutes, so you can get it set up and ready for bed quickly! We like that the mattress has a built-in pillow section across one end, so you can either ditch the pillow, or use it for added support under your regular pillow! The heavy-duty polyester fabric is waterproof and stretch-resistant, so your mattress will look good and stay in working order for a long time. This is a great investment in your home, especially if you have frequent guests over throughout the year! 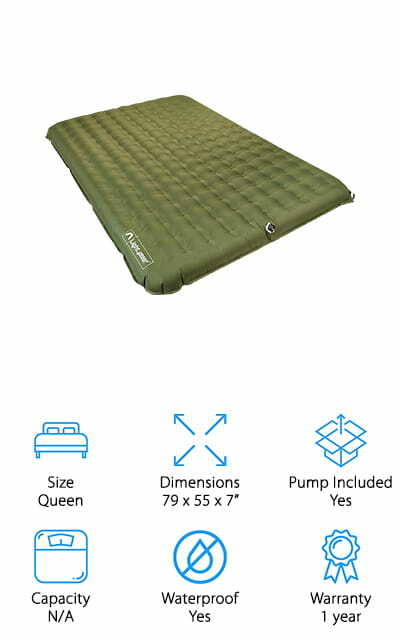 If you’re looking for the best air mattress for sale to take on your next backpacking trip, this mattress from KingCamp is a great option! The double-sized mattress packs small and is super lightweight at just under 8 pounds, so you can easily throw it in your backpack and go! Instead of wrangling with a heavy or cumbersome air pump, this one has a built-in foot pump that saves extra space and weight. With just a little footwork, you can have it inflated and ready to sleep on in about 2 minutes! There is a valve on it to use an air pump, but honestly, it fills up so fast with the foot valve you won’t need it! It also deflates quickly and rolls up easily to get you back on the trail in the morning. We also like that it’s made of 100% polyester that is puncture and stretch-resistant, and it comes with a repair kit just in case! Next up in our camping air mattress reviews is this sturdy mattress that’s great for using outdoors or indoors! This mattress inflates to 9 inches thick, which is great for use in a tent, truck bed, or a spare bedroom! It can hold up to 650 pounds, which means you and a partner can sleep easy knowing it will stay firm all night! We like that it’s made of quiet PVC, which won’t crinkle when you toss and turn! To inflate your mattress, this kit comes with a rechargeable air pump you can take anywhere! Charge it at home, or if you’ll be gone for a few days, recharge it in your car while you’re out camping. We like that this is a seriously efficient pump – it can inflate or deflate the mattress in about a minute! It also packs up small to store it in your camping gear, trunk, or back of the closet for whenever you need it. In addition to looking for queen-size camping air mattresses, we also wanted to find you a great option for a twin-sized air mattress if you just need a little sleeping room! 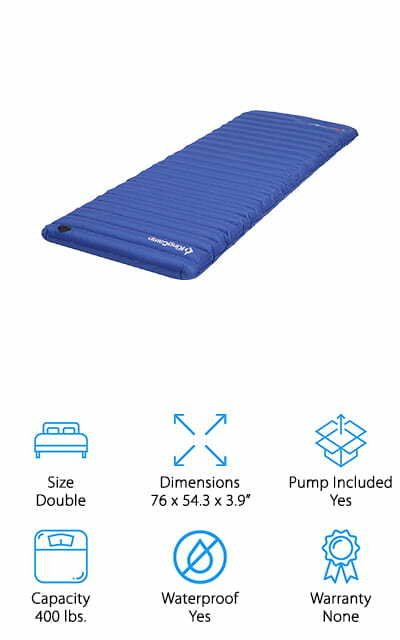 For a solo hiking or camping trip, we think this small air mattress from Therm-A-Rest is perfect to keep you cozy and comfortable! It’s a self-inflating mattress with a foam top, so no need to worry about lugging around a pesky pump! Just open the valve, unroll it, and it’ll do the work for you! If you want it a little firmer, you can blow a few deep breaths into it if you need to! We like that this mattress is compact, and rolls down to 7” x 26”, which is great for attaching to your hiking backpack! The foam is one of our favorite features on this mattress! It’s comfortable, supportive, and retains heat well, making this a great mattress to take with you on really cold nights! Want to give your houseguests a luxurious experience without blowing your budget? Consider grabbing one of these tall, comfy air mattresses from Zoetime to treat your guests right! 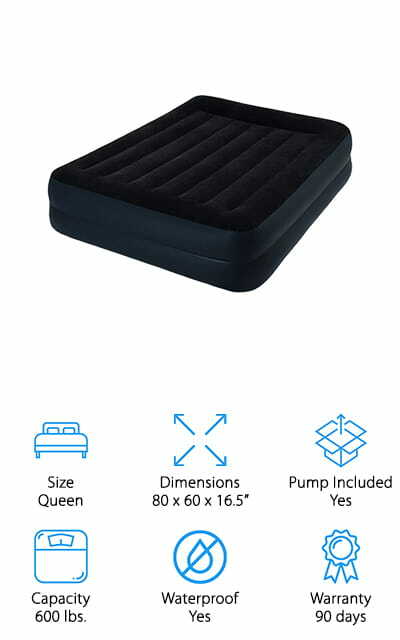 This queen-sized air mattress blows up to 22 inches deep, so your guests won’t feel like they are sleeping on the floor at all! We like that this mattress inflates or deflates in only 4 minutes, thanks to a built-in air pump. You can set this up in a hurry when unexpected guests arrive! We also like that it has a raised pillow on one end for extra support, and raised edges to prevent falling out if your partner jostles around in their sleep! This waterproof mattress will work in a taller tent, but it’s probably best used in a spare bedroom or living room. 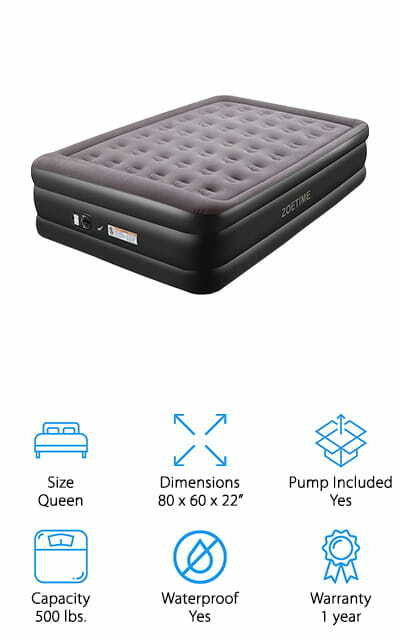 If you want an air mattress that feels like sleeping on a real bed, this is a great mattress to keep around the house for future houseguests! Let’s end our camping air mattress reviews today with one of our favorite camping air mattresses to take with you on your next cold-weather trip! This inflatable mattress from Sable is heavy-duty and made to use in the cold. The waterproof PVC is eco-friendly and super durable, holding over 660 pounds without tearing or stretching over time! The flocked top is thick, which helps retain heat in cold weather. You can sleep comfortably on this mattress, even in sub-zero temperatures! It sets up quickly, and you can use whatever electric or hand pump you have at home to inflate it! We like that it can withstand a lot of use, and packs up easily to fit in your car, duffle bag, or luggage. We think this also makes a great mattress for extra houseguests or sleepovers with friends! They’re also fairly inexpensive, so you can grab one for camping outside and one for the occasional houseguest without breaking your budget!